Once bitten, twice shy. The phrase could so easily have been coined by someone who'd taken a dooking in the River Spey. 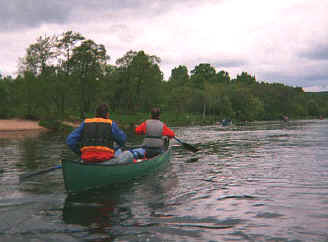 When you've had the misfortune to roll out of a canoe into the decidedly chilly waters of Scotland's fastest flowing river once, it stiffens the resolve to stay afloat in future. Unfortunately, capsize is a bit of an occupational hazard when your crashing over rapids, something I was to find out at first hand. My rude awakening came early on in a five day paddle from Kingussie to Spey Bay and it was probably no bad thing. There's a terrible inevitability when you feel your canoe tipping to the point of no return. Myself and my fellow paddler Bill, from Ullapool, caught the branches of a fallen tree as we attempted to negotiate some tricky whitewater. We were tossed unceremoniously overboard and natural survival instincts quickly kicked in. Bill managed to swim safely ashore while I clung to the upturned hull of our craft, adamant she was not going to escape downstream. Once in, the swim was wonderfully bracing and a lifejacket ensured my head stayed above water. But it was tempered by the thought of being crushed between the runaway boat and some jagged submerged rock, a feature, as we were to find out, not uncommon in the Spey. Thankfully help was at hand and the stricken vessel, with me stuck fast like a limpet, was guided safely into the shore. The worst moment, however, was still to come - clambering out on to the beach only to be met by a chill wind which whistled through sodden shorts and fleece top and wicked a course right to my core. Reviving coffee was close at hand and, after a quick dry off, we were back on the water, rejoicing in the fact it was probably just one of the many joys we had to look forward to. Our 100 mile trip, spread over five days and meandering through some of the finest scenery Scotland has to offer, was organised by the John Muir Award, a project run by the John Muir Trust to encourage people of all ages to become actively involved in the discovery and conservation of remote and wild places. The trust owns a handful of estates scattered across the country. Their profile was raised significantly recently with the purchase of Scotland's highest mountain, Ben Nevis, and one of her most shapely peaks, Schiehallion, in Perthshire. 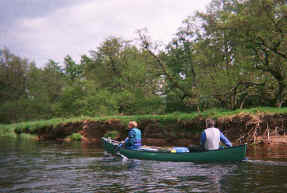 We hit the water on a bright Friday morning after a night spent at the RSPB's bunkhouse in the tiny hamlet of Insh. Our intrepid leader, Dave Picken, outlined a little of what we could expect over the coming days before RSPB warden Tom Prescott highlighted some of the flora and fauna we should be looking out for. The Insh Marshes, through which the early part of our route passed, form a wetland of international recognition, hosting a diverse range of rare plants and insects and home to creatures such as the shy goldeneye duck, osprey and kingfisher. This is also one of the few places in the UK where you'll find the aspen tree. There is talk of the beaver being introduced to this part of the Spey as part of a project being led by Scottish Natural Heritage. It became clear at this point that we weren't going to escape without doing some work for our supper. Tom set us the task of spotting and recording some of the more unusual birds that live on the river, and we were also charged with noting where the elusive aspen was growing. The calm waters gave us an opportunity to get to grips with our Canadian canoes, transport and packhorse for the journey of discovery ahead, under the watchful eye of our instructor Vic Rathall. The winding river took us down through the Marshes, where early sightings were noted, before we were thrust out into the open waters of Loch Insh, a spirited headwind making our crossing hard work. On the far side an osprey nest atop a tall pine tree was pointed out, its occupant soaring overhead. We then rejoined the river and paddled on to our first campsite of the trip. Tents pitched amid the scrub, we devoured supper hungrily before gathering round a blazing fire to while away the evening. It was an ideal opportunity for everyone to get to know each other. The group consisted of a diverse range of people from all over the UK, all brought together by their interest in the work and ideals of the John Muir Trust. Alan, a countryside ranger from Cheshire, was accompanied by his partner Morag; husband and wife Bill and Jean hailed from an island off the west coast, near Ullapool, while a contingent from London included Peter and his son Will and a second Peter. Don, from Somerset and in his sixties, was the oldest member of the pack, then there was Stewart, who works in Aberdeen's offshore industry, and me. 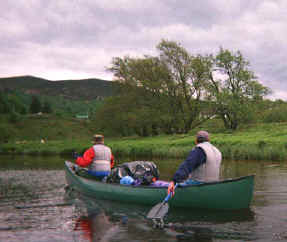 A good night's sleep followed and by early morning we were back on the water, heading north past the mouth of the River Feshie. Some rapids downstream provided ideal practice ground for skills tuition and it was a little further on from this that I endured my first capsize. Thankfully all the kit for a trip of this sort, from sleeping bags to food, is safely stowed in dry bags and barrels, lashed to the canoes to prevent escape and saturation when such a situation arises. Thankfully the sun was on hand to dry us out as we pulled into Aviemore for lunch. As we munched on our sandwiches, Dave explained how in years past timber felled in the pine forests of Rothiemurchas was floated from here down to the mouth of the Spey where it was used to build boats in the port of Kingston. From Aviemore to Grantown-on-Spey the glen is fairly wide and wooded and there were tempting views to the Cairngorm plateau and neighbouring Bynack More, snow dusting the peaks. Our next overnight stop was at a delightful little riverside campsite at Balliefurth where another roaring open fire was put to good use drying out wet clothes and shoes. 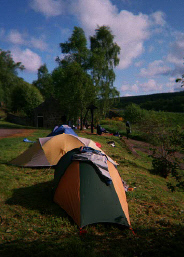 This time we even had the luxury of a toilet and hot running water! After two days of hard paddling through relatively slow, treacle-like water, day three saw us launch into a more energetic Spey. Rapids ahead sharpened our physical and mental focus, submerged rocks threatened to throw a spanner into the works at just about every turn. Supplies were purchased in Grantown, a bustling little community of neat granite buildings founded in 1766 by James Grant of Castle Grant. As we returned to the river, the rain came on heavy but its presence did nothing to dampen spirits as white water was encountered and overcome. One of the most exciting bits of the trip was a set of rapids just short of our next campsite at Blacksboat. We pulled in beforehand as Vic talked us through the challenge ahead. We departed one by one to face it. The first five boats came through unscathed but Dave and his partner for the day, Peter, were less fortunate, their craft rolling as they sped out of the rapids. Two boats down, four to go. Blacksboat once boasted a railway station and the building and platforms have been preserved to provide a basic campsite for walkers trekking the recently opened Speyside Way. As we pitched by the platform, our prayers for better weather were answered as the clouds that had dominated the afternoon parted to bless us with a beautiful evening. When dusk arrived, the station building erupted into life as scores of bats flitted out from under the eaves in search of their supper. Day four was a late starter, the canoes remaining in dock until after midday due to salmon fishing on the next stage of the river. When we did get underway, Will and Don - who'd spent his evening drying off wet clothes - took an immediate dip, their boat catching a riverbed rock broadside as they launched into the current. With the river narrowing, another challenging stretch of white water was tackled lower down before a stop at Knockando where a brief foray was made into the Tamdhu distillery - one of the many distilleries in the Spey valley - only to find there were no free drams on offer. More rapids followed but by now our expert tuition saw us sail through everything in our path and it was hard to believe we'd succumbed to such an easy obstacle earlier in the trip. After navigating a series of hopeful flycasting fishermen and passing beneath the impressive steel arch of Thomas Telford's bridge at Craigellachie, we went ashore for our final night's camp, taking advantage of another Speyside Way facility. Famous for its salmon, we'd seen only occasional appearances from this graceful fish so far on our trip down the Spey, but that evening some local anglers casting their lines upstream from out camp were rewarded with an impressive 20lb catch. The final day dawned after a restless night on my part. Perhaps it was the anticipation of more challenging waters ahead. Or maybe just not enough whisky before bed. Whatever, we teamed up in pairs, this time the lucky six who hadn't gone under each joining one unfortunate soul who had. There were plenty more fishermen up to their wader-clad waists in the water to canoe round (our tally of brand new Range Rovers parked on the riverbank was now well into double figures) as we passed by Rothes and then on under the main Aberdeen to Inverness railway line. Another salmon was netted by an anxious angler who'd spent all morning out in the rain. He was clearly pleased his luck had finally changed as we drifted by. The rain was to accompany us on the final leg of the voyage, much of it in the shadow of steep sandstone cliffs where pine trees clung precariously to the high bank, most just one good spate away from a tumble. After a brief coffee break below Fochabers, we emerged from the narrow confines of the river into the wide splay of Spey Bay, the open sea occupying a perfectly flat line on the horizon ahead. A flock of whooper swans welcomed us to journey's end and, as is all too often the case in Scotland, the weather perked up considerably as we hauled our gear up the pebble beach to board the bus home. The driver stuck closely to the River Spey, offering us a land-based overview on our waterborne adventure. The trip was certainly a voyage of discovery for me. I'd started at Kingussie with next to no canoeing skills but could now handle such a craft reasonably confidently. I'd spotted unusual birds and plants I'd perhaps otherwise never have noticed and gleaned a completely new perspective on this wonderful part of Scotland. Despite glancing blows with civilisation, the trip had been a great opportunity to get away from all those pesky distractions of modern day life, like television, cars, mobile phones and all the other things we think we can't get by without. Maybe we can?